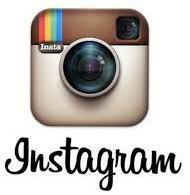 Feedback: 58 comments - leave yours! I am at Neal's Yard, a cult shop for British cheese lovers. There are bigger cheese shops in London, selling fine crusts from the world over. But I don't come to London to buy Gruyère or Gorgonzola. I want British cheese. That's what's unique. That's what's special to the place. Let's eat the products of the realm. 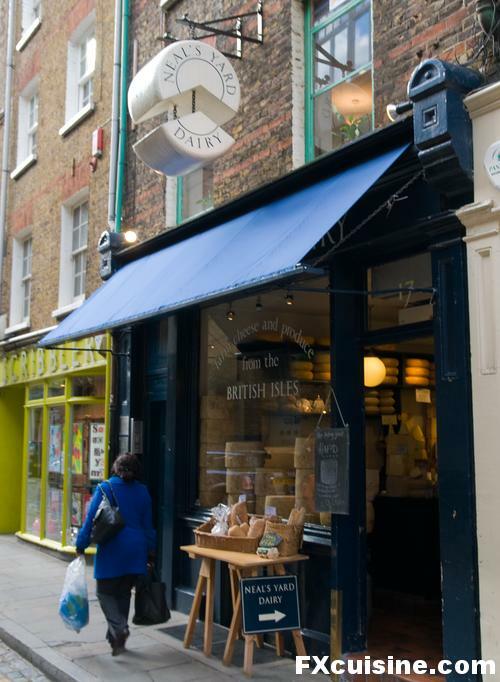 And Neal's Yard offers the best selection of British cheeses in the world - 57 in all and only 3 imports - not a bad selection! And there is no question that they get the finest heads in the realm for all the cheese types they carry. The cheesemakers at Montgomery's had told me about neelzhard who bought half their production. 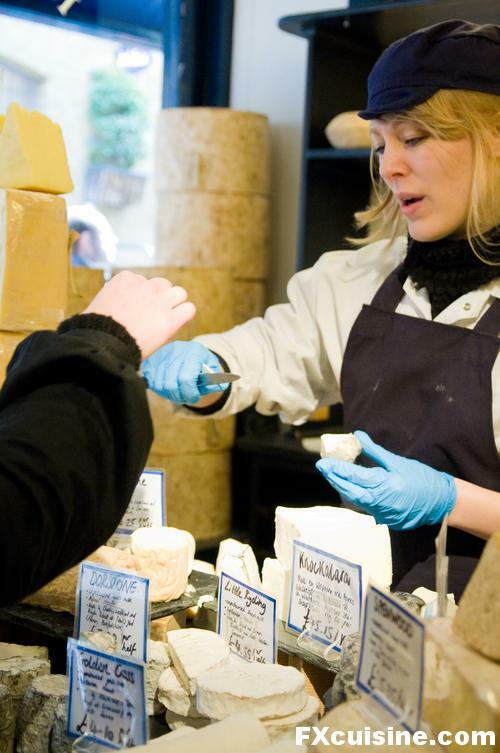 This really is the place for the discerning cheese lover and there is something to keep make happy - even vegetarian rennet. I usually charge my weight in cheese for an official FXcuisine endorsement, but in this case I might half my fee. Tell Neal I'm here! doesn't bring the lord of the manor in this shop. «Neal's Yard», you see, is not where «Neal» has a cheese yard sale, but the name of a back alley in Covent Garden, London. In a sort of large courtyard they have all sorts of organic shops and the former house of British director Monty Python. The big cheese at Neal's Yard Dairy is Randolph Hodgson, who's been running the business for 25 years and now exports fine British cheeses all over the world. But this is a girl's cheese! Give me something for a grown up man, I exploded. Tom, the jovial cheesemonger, bursts into laughs, then leans back to tell my joke to his colleagues. 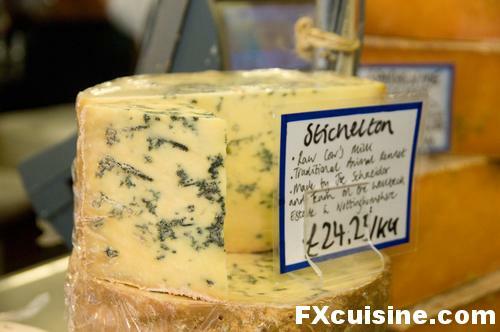 Yes, I want cheese with taste, and after having sampled the extraordinary Colston Bassett Stilton at Neal's Yard Dairy in London, most other cheeses tasted rather bland - in comparison. We settle on a fine Stichelton. A touch by the Penicillium fairy will turn any cheese into a gourmet delight. 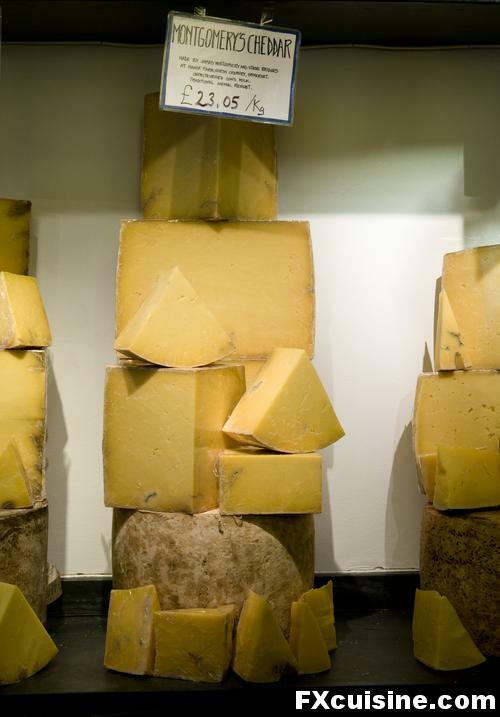 On the back wall, a pile of James Montgomery's great Cheddar awaits the punter at 23£ a kilo. I paid a little less when we visited his farm last summer, and boy was it worth it! This time I go for Keen's Cheddar, not so different from Montgomery's and made in a farm just 15 miles for his. ... then I pay, £38 for 5 pieces of cheeses, a kilo and a half of pure slow food delight. What did I buy? How did it taste like? See and learn all - next page.